Thanks to everyone who has read my post. Any comments made would be appreciate. copper wire wrapped white and red and black by CraftsbyKnight. Today was a good day, I managed to post two items on etsy, I would appreciate any critiques that any readers have on the listing. I am not good at writing descriptions, so any advice will be appreciated. 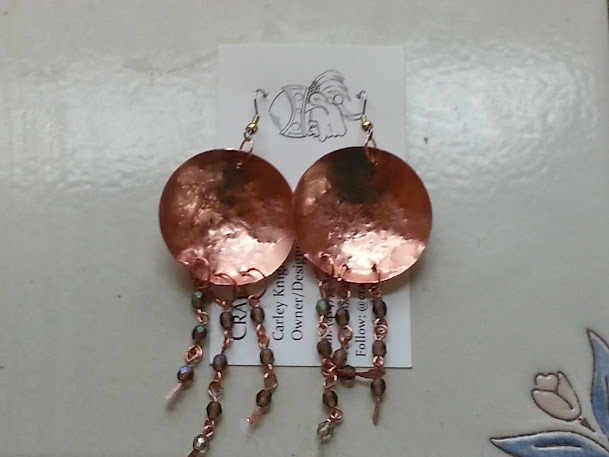 here is a pic of the earrings that I made today, let me know what you think! As I said in the beginning of the post I finally listed two items on my etsy store. I find it to be really difficult to name my items and write descriptions. If anyone has any advice, please tell me. I also joined a bunch of teams on Etsy. At the craft party on Friday. Moira told me that I should join teams to gain publicity. I should spread the word about my blog and people will come and read it.